What Lance Armstrong, And The USADA, Might Gain From A Confession : The Two-Way The news that disgraced cyclist Lance Armstrong might be willing to confess to the doping charges he spent years denying has reopened interest in his case — and opens the question of whether his lifetime ban from competitive sports could be eased in exchange for Armstrong's cooperation. 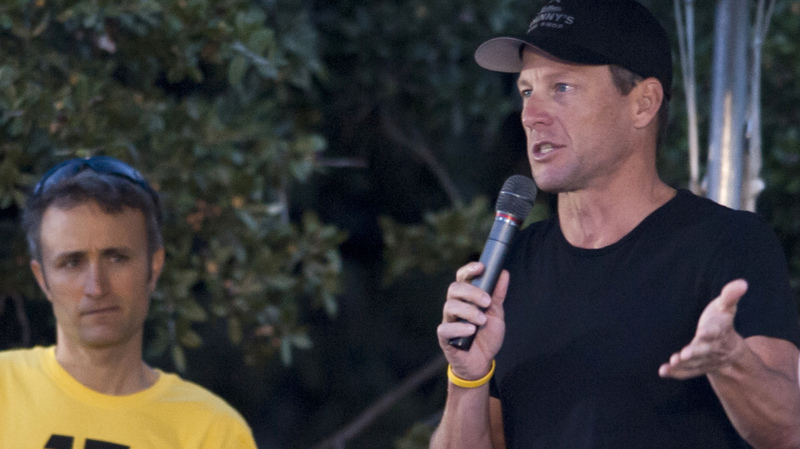 Lance Armstrong, seen here at a LIVESTRONG Challenge Ride in October 2012, might be willing to confess to doping — in exchange for an easing of his lifetime ban, according to reports. The news that disgraced cyclist Lance Armstrong might be willing to confess to the doping charges he spent years denying has reopened interest in his case — and in the question of whether his lifetime ban from competitive sports could be eased in exchange for Armstrong's cooperation. Juliet Macur of The New York Times, whose report on the new possibility Friday cited unnamed sources, says that in her view, Armstrong, 41, would like to trade his cooperation for a reduction in the lifetime ban he received when he ended his fight against the doping charges last August. "What he wants to do is compete again," Macur tells All Things Considered co-host Melissa Block. "He's been competing since he was a teenager, in triathlons, and has basically defined himself as an athlete. He has not been able to compete for the last several months, because he has the lifetime ban from the U.S. Anti-Doping Agency. In her article, Macur says a source told her that Armstrong met with his former nemesis, USADA chief executive Travis Tygart in December, and that he has also sought to meet with David Howman, the director general of the World Anti-Doping Agency. Officials of USADA declined to comment on the story Saturday, reports Velo News. Tim Herman, Armstrong's attorney, has denied reports that his client has contacted anti-doping officials about a possible full confession. But that hasn't stopped people from speculating about whether Armstrong would cooperate with anti-doping agencies. Chicago blogger Brent Cohrs ponders that question, and the former champion's possible motivations, in a post today, titled "Will It Really Matter If Lance Armstrong Confesses?" "Lance has had a couple of months now to contemplate the high price he paid for cheating," Cohrs writes. "While USADA's Travis Tygart succeeded in bringing Lance down, his efforts to hold Lance's team director, Johan Bruyneel, accountable for his role in the doping conspiracy have been thwarted repeatedly. Lance may have one card left to play after all... Johan, Lance is coming for you." The agencies might be tempted to accept Armstrong's full confession, Macur says, if it helps them advance their cause — fighting performance-enhancing drugs and blood treatments. "Their interest in this whole thing is to try to clean up sport," she says. "Doping is a huge problem in every sport, really... we see it at a high school level, and even a middle school level, these days. But their interest is helping clean up cycling, which has had a major, major doping problem for, really, the last 100 years." Still, if Armstrong does offer a full confession, it could weaken his chances in his remaining legal troubles, which are not insubstantial. "The U.S. Department of Justice is considering whether to join a federal whistle-blower lawsuit filed by former Armstrong teammate Floyd Landis," the AP reports. Macur calls that case, filed in 2010, "the biggest," noting that "Lance, and some other officials on the U.S. Postal Service team, defrauded the government by basically using taxpayer dollars to fund their doping program. And the government right now is mulling whether to join that lawsuit. And if they do, there's a good chance that they will win it." "A Dallas-based promotions company has also said it wants to recover several million dollars paid to Armstrong in bonuses for winning the Tour de France. The British newspaper The Sunday Times has sued Armstrong to recover $500,000 paid to him to settle a libel lawsuit."